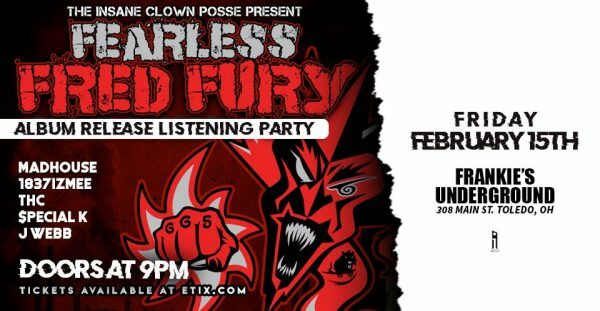 ICP’s “Fearless Fred Fury” Release Party in Toledo, Ohio [hosted by J-Webb]! That being said, Toledo didn’t want to be left out, so the homies at Frankie’s Underground decided to put one together themselves! It’ll be hosted by former Psychopathic Records publicist J-Webb, and will feature performances by Madhouse, 1837IZMEE, THC, and $pecial K! The full FFF album will be played between sets from local artists, and then J-Webb will conclude the evening with a Juggalo Jamboree! Click to visit the Facebook event page! Hopefully you Toledo Juggalos show out in full force for this one!